Wrapping up the school year farm season with a Garden Party! Youth Farm and Nellie Stone Johnson 5th Graders from room 127 wrapped up a great school year garden season Tuesday with a garden party! Throughout the school year 5th graders learned seeding and transplanting skills in order to teach the H-5 through 4th graders these skills. 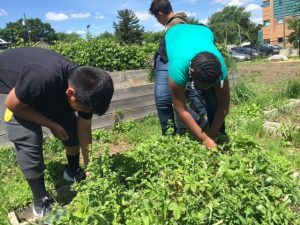 As a school, over 250 students planted 30 greenhouse trays in April and the entire school farm in May. Needless to say, the 5th graders had a lot to celebrate. As part of our garden party, Youth Farm was presented with a Garden Book made by the 5th Graders of room 127 and we snacked on rhubarb jam, salad with greens and radishes, and cheddar chive biscuits all made with produce from the farm. Thanks Nellie Stone for a great school year farm season. 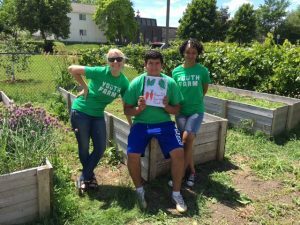 At Youth Farm, we are looking forward to summer school and the fall harvest. 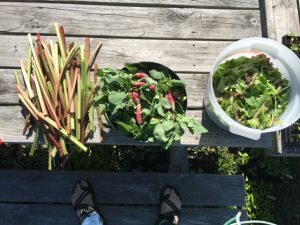 The first harvest at Nellie Stone Johnson Farm just in time for the last day of school. 5th Graders hunt for strawberries during the Garden Party. Hawthorne Farm Stewards and Nellie Stone Johnson Farm Managers Divine and Sergio are presented with the 5th Grade Garden Book. Previous PostPrevious Jack-an exceptional leader (and dodgeball player)!